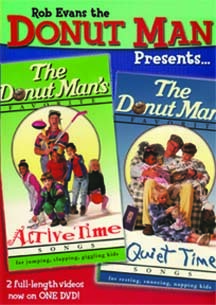 Two video titles on one DVD! The Donut Repair Club present their favorite "Active Time Songs", a great way to sing and skip your way through action songs with hand-motions that teach kids great lessons about God and themselves. A great solution for energy-burners on a rainy day! "Quiet Time Songs" help kids to wind-down as they sing about God's great love. Designed to give Mom & Dad a break: the best idea since cookies, milk and the rocking chair! When your kids are 'itchin' for some gigglin', "Active Time Songs" is what the doctor ordered. Join the Donut Man, Duncan, and the Donut Repair Club as they skip, sing and dance their way through their favorite action songs. Songs include: Shout Hosanna, God's Not Dead, Victory Chant, HiYa HiYa, Run Peter, Run! Sing & Skip & Dance, Noah, Lamb's Praise, The Potter's House, Wonderful Saving Love. And when YOU need a break? "Quiet Time Songs" is the perfect remedy when they need a little help winding down. Kids will love singing story-songs about God's great love; seasoned with a dash of peace that helps kids make a smooth landing in... dreamland. Songs include: The Bath Song, In His Arms, He Never Sleeps, The Mustard Seed, You Are The Lamb of God, Jesus Loves Me, O The Blood of Jesus, God Is So Good, I'm So Wonderfully Made, Home Sweet Home, Change My Heart Oh God.